20 March 2018 Since the early 1990s, ICMA has devoted considerable resources to developing a standard master agreement for repo. The first version of the GMRA was published in 1992 and was followed by substantially revised versions in 1995, 2000 and 2011. ICMA obtains and annually updates opinions from numerous jurisdictions worldwide on the GMRA 1995, 2000 and 2011 versions for the benefit of its members. ICMA’s European Repo and Collateral Committee recently decided to discontinue coverage of the GMRA 1995 in the ICMA GMRA legal opinions from 2019 onwards. 14 March 2018 The European Repo and Collateral Council (ERCC) of the International Capital Market Association (ICMA) has today released the results of its 34th semi-annual survey of the European repo market. The survey, which calculates the amount of repo business outstanding on 6 December 2017 from the returns of 64 offices of 60 financial groups, sets the baseline figure for European market size at EUR 7,250 billion. This is the largest figure ever recorded by the survey since it began in 2001 and exceeds pre-crisis figures for the size of the repo market in Europe. After a period of 4 years where market size has remained static, with largely seasonal fluctuations, this survey shows growth, in terms of contracts outstanding on the survey date, of 12.3% since the last survey in June 2017 and 28.2% year on year. 28 February 2018 ICMA's AMIC has responded to a consultation by the UK Financial Reporting Council (FRC) on the review of the UK Corporate Governance Code and on the UK Stewardship Code. The AMIC response calls for an enhanced role for bond holders in corporate engagement with stakeholders but recommends that the comply and explain approach is retained as a flexible way for companies and investors to adhere to the Code. AMIC looks forward to continued engagement with the FRC, in particular when a more thorough review of the Stewardship Code is launched later this year. 22 February 2018 ICMA has responded to the European Commission’s consultation 'Public consultation on building a proportionate regulatory environment to support SME listing'. Limited to one question relating to the applicability of the MAR soundings regime to private placement, the response was supported by the MAR Working Group of the ECPP Joint Committee and amplifies the findings of the recently-released Linklaters/BCG study “Identifying market and regulatory obstacles to the development of private placement of debt in the EU”. 15 February 2018 ICMA has published a report on the current state and evolution of the European corporate single name credit default (SN-CDS) market, focused on its benefits for liquid and efficient corporate bond markets. We are pleased to announce the results of the 2018 ICMA European Repo and Collateral Committee elections. The 19 individuals that were elected to the new ERCC Committee are listed below. The term of office of the new Committee will be approximately one year starting immediately and ending on the day the results of the 2019 ERCC elections will be announced. The following firms were admitted to ICMA membership in February 2018. Bringing the total number of ICMA members to 531 members in 61 countries. Click here to view the full list of ICMA members. 1 February 2018 The International Swaps and Derivatives Association, Inc. (ISDA), the Association of Financial Markets in Europe (AFME), International Capital Market Association (ICMA) and the Securities Industry and Financial Markets Association (SIFMA) and its asset management group (SIFMA AMG) have today launched a roadmap that highlights key challenges involved in transitioning financial market contracts and practices from interbank offered rates, or ‘IBORs’, to alternative risk-free rates (RFRs). “We have been pleased to contribute to the European Commission’s HLEG on Sustainable Finance from the outset, and see the final report released today as a real step forward in creating a framework for the financing of a sustainable European economy. We believe that many of the recommendations in this report will be taken into the European Commission’s Action Plan on sustainable finance, contributing also to the critical Capital Markets Union Initiative. In particular, the proposal for an EU classification system, or taxonomy, would provide additional clarity and detail for issuers and investors in the green bond market where ICMA supports the Green Bond Principles. We note also key recommendations such as for a European green bond standard, complementary to the market developed Green Bond Principles, and for the clarification of investor duties to extend the time horizons of investment and bring greater focus on ESG factors into investment decisions. As the report itself underlines, the challenge will be to find the right balance in implementation and ‘to not increase the regulatory burden and complexity given the ultimate purpose is to facilitate more investment’. 23 January 2018 Today ICMA’s Asset Management and Investors Council (AMIC) has published its response to the publication of the proposals to review the European Supervisory Authorities (ESAs) and the European Systemic Risk Board (ESRB). 16 January 2018 The Hong Kong Monetary Authority (HKMA) and the International Capital Market Association (ICMA) will co-host the Green and Social Bond Principles Annual General Meeting and Conference in Hong Kong in June. The annual general meeting and conference is a flagship international green finance event, bringing together senior public and private sector representatives from all over the world to discuss market and regulatory developments. This is the first time that this event will be held in Asia, which is home to a rapidly growing green bond market. Cumulative green bond issuance in Asia reached almost USD 80 billion by end of 2017, with China dominating volumes – at USD 31 billion in 2017 alone. 15 January 2018 (London, UK) ICMA has published a report on the European repo market at year end 2017, based on market data and interviews with market participants (sell-side and buy-side) to provide a brief analysis of the way the market performed and the underlying factors that affected it. We are delighted to announce that Michael Sansen of ING has been appointed as the new Chairman of the Future Leaders Committee, with a term date of 3 years. Michael has been an active and dedicated committee member since the Future Leaders committee was launched and has worked closely with his predecessor, Konstantin Angelidis of Rabobank. We would like to thank Konstantin for his hard work and leadership during his term as the first Chairman of the committee. 18 December 2017 ICMA has today published an updated version of the ICMA ERCC Guide to Best Practice in the European Repo Market along with a consolidated blackline of amendments to the Guide since it was previously updated in February 2017. The following firms were admitted to ICMA membership in December 2017. Bringing the total number of ICMA members to 536 members in 61 countries. Click here to view the full list of ICMA members. 7 December 2017 The Global Green Finance Council (GGFC) has today published the first version of its reference guide to global and regional policy initiatives on green finance. 22 November 2017 ICMA’s ERCC Ops FinTech Working Group (WG), a subgroup of the ICMA European Repo and Collateral Council (ERCC), has published today a mapping directory of over 80 technology solutions available for repo and cash bond operations. The directory is divided into 10 categories including collateral management, exposure agreements and reconciliations. It provides information on how each solution can be used, for example at which stage of the trade lifecycle, whether for cleared or uncleared transactions and where the solution sits within the IT infrastructure. The ICMA Ops FinTech mapping directory compares the capabilities of different providers and seeks to create greater transparency in a very dynamic and fluid market. It focuses on providers and solutions that are used by WG members, and is intended to be a living document. All responses in the mapping have been put together in close collaboration with the vendors and validated by them. The document can be accessed by ICMA member firms and the public on ICMA’s website. Over the course of the mapping exercise, a growing number of technology solutions was identified across the aforementioned categories. Whilst the mapping directory covers over 80 technology solutions in total, it does not constitute an exhaustive list of providers in the market. It will be updated on a regular basis to include other existing or new solutions. 20 November 2017 Today the European Commission published the final report of the Expert Group on Corporate Bond Markets, Improving European Corporate Bond Markets. The Expert Group on Corporate Bond Markets (originally the Expert Group on Corporate Bond Market Liquidity) was created in late 2016, following concerns raised in the CMU Call for Evidence related to European corporate bond market efficiency and liquidity. The 17 Group members represent a cross section of industry stakeholders in the European corporate bond markets, covering the entire value chain (issuers, market-makers, investors, infrastructure providers, and trades associations). ICMA was pleased to represent its constituents as a member of the Group. The reports will officially be launched and discussed at a European Commission public hearing in Brussels on 24 November 2017. 15 November 2017 The ICMA ERCC has submitted a response to the European Commission’s consultation on “Post-trade in a Capital Market Union: dismantling barriers and strategy for the future”. The response focused on collateral and repo specific aspects of the consultation and was prepared based on feedback received from members of the ERCC Operations Group. The consultation itself follows up on the conclusions and recommendations of the European Post-Trade Forum (EPTF) an expert group set up by the Commission in the context of the CMU project. The final EPTF report was published alongside the current consultation. ICMA has been an active member of the EPTF, represented by ICMA ERCC Chairman Godfried De Vidts. The final EPTF Report is available here. The following firms were admitted to ICMA membership in November 2017. Bringing the total number of ICMA members to 533 members in 62 countries. Click here to view the full list of ICMA members. (Tokyo, Japan) The International Capital Market Association and the Japan Securities Dealers Association, have today co-hosted a conference in Tokyo focused on the rapidly growing green and social bond markets of Asia. Investors, underwriters, issuers, policy makers, service providers and other stakeholders met to discuss recent progress and the conditions required to stimulate future growth. The conference was over-subscribed, with 500+ registrations ahead of the event. Frontclear study - Repo: OTC or exchange-traded? Frontclear, whose purpose is to facilitate more participative interbank markets, has commissioned a study to assess whether an exchange is likely to be more effect than an over-the counter (OTC) market in fostering the development of domestic repo trading in emerging financial markets, particularly frontier markets. The study, carried out by Richard Comotto the author of ICMA’s European Repo Survey, considers the arguments in favour of and against trading fixed income repo in OTC markets and exchanges, and reviews the evidence from four repo exchanges, Costa Rica, Kazakhstan, South Africa and Vietnam, with complimentary case studies from China, the Philippines, South Korea and European markets. 27 October 2017 On 26 October 2017 the ECB’s Governing Council announced changes to its Asset Purchase Programme (APP). This was largely in line with consensus expectations of an extension of purchases, at a reduced rate, and with a shift in emphasis towards forward guidance. However, this is likely to have implications with respect to market efficiency and liquidity, impacting the sovereign, credit, covered bond, and repo markets, and so the core of ICMA’s work and focus. The APP, in particular the CSPP and PSPP components, will continue to have major impacts on ICMA’s focus areas, and the intersection of monetary policy and market regulation will remain a high priority of the ICMA Secondary Market Practices Committee (SMPC), European Repo and Collateral Council (ERCC), as well as other key fora and working groups, particularly to the extent that it affects market functioning and efficiency. Download the Chinese version of the report. 17 October 2017 The European Repo and Collateral Council of the International Capital Market Association (ICMA) has released the results of its 33rd semi-annual survey of the European repo market. The survey, which calculates the amount of repo business outstanding on 7 June 2017 from the returns of 64 offices of 60 financial groups, sets the floor for market size at EUR 6,455 billion. 16 October 2017 ICMA’s members have used IOSCO’s consultation on regulatory reporting and public transparency in the secondary corporate bond markets to voice concerns about the imminent implementation of the MIFID II/R pre- and post-trade transparency regime. In particular, members are keen to stress that while market transparency, in principle, should be viewed as a public good, it should not be an end in itself. Ultimately, efficient and liquid markets are the most important considerations for investors, and the public availability of market and trading information is only desirable to the extent that it improves market efficiency and enhances protection for investors and issuers. With this in mind, policies and calibrations for market transparency should also be consistent with and supportive of political objectives to develop or expand deep and effective corporate bond markets as a primary source of financing for the real economy, such as the European Union’s Capital Markets Union (CMU) project. 5 October 2017 ICMA responded, jointly with the ASF, GFMA and IIF, to the BCBS/IOSCO’s Consultative Documents on criteria for and capital treatment of simple, transparent and comparable (STC) short-term securitisations. Although the Associations support the Committee’s goal of “assisting the financial industry in its development of STC securitisation structures,” we believe that the mechanisms proposed by the Committee to achieve that goal go too far, risk making the process for obtaining preferential RBC treatment overly complicated, and ignore the strong credit performance over several decades of ABCP conduits (distinct from SIVs and “arbitrage conduits”) backed by “real economy” assets such as trade receivables, auto loans and leases, etc. We respectfully suggest that our proposals, if adopted, would achieve the Committee’s goal of ensuring that ABCP transactions are structured prudently, justifying less capital, without creating unnecessary and impractical complication that would discourage compliance with the STC criteria and disrupt the operation of the ABCP market. 26 September 2017 (Hong Kong) ICMA’s European Repo and Collateral Council (ERCC) and ASIFMA’s Secured Funding Markets Committee have today released the results of a pilot survey of the Asia-Pacific repo market. The Asia-Pacific survey uses similar methodology to the long-established ICMA ERCC European repo market survey, which reports the value of repos and reverse repos outstanding in the market at close of a chosen business day, in this case 7 December 2016. 18 September 2017 AMIC responded to IOSCO’s consultations on (1) CIS Liquidity Risk Management Recommendations and (2) Report on Open-ended Fund Liquidity and Risk Management – Good Practices and Issues for Consideration. Issuance in the green bond market now stands at over $72billion for the year to date, and on target to significantly exceed the previous record of $81billion for the whole of 2016 (Source: Climate Bonds Initiative). The diversity of issuers is expanding rapidly globally and across issuer types, encompassing financial institutions, supranational and corporate issuers, as well as recent landmark inaugural sovereign issues from France and Poland. The geographic spread of issuers has also increased in both developed and emerging markets, in all continents. The common thread remains the reliance on the GBP. Bringing the total number of ICMA members to 527 members in 62 countries. Click here to view the full list of ICMA members. We are now sending out monthly updates on the practical implementation of MiFID II/R relating to primary markets, secondary markets, repo and collateral markets, and research unbundling for asset management. ICMA has made available high-level data from a number of suppliers on its website with the intention of providing an overview of European secondary investment grade corporate bond markets to complement its own studies. The data will be updated every month. 15 August 2017 ICMA's AMIC has submitted a response to the Central Bank of Ireland’s Discussion Paper on Exchange Traded Funds (ETFs). AMIC has long taken an interest in the development of ETFs. AMIC has long taken an interest in the development of ETFs. In 2011 AMIC published a short general paper on ETFs with a description of different types of ETFs, the state of the ETF market, assessments of market trends in ETF development and usage, the future development of the ETF market and the value of the ETF brand. More recently, AMIC’s interest in ETFs is limited to their relevance to the debate on systemic risk. We have already been active in the global debate on the possible systemic risk related to asset managers. 19 July 2017 ICMA's Asset Management and Investors Council (AMIC) and the European Fund and Asset Management Association (EFAMA) have published today a report on leverage in investment funds. This paper analyses how leverage is used, how the European legislative framework regulates leverage, how international regulators are addressing this topic and how the risks related to leverage are addressed from a technical perspective. Data sharing among regulators of already reported data is key and should be improved at both EU and global level. This would enable regulators to better assess the overall risks related to funds in Europe and globally. The report is available here and the press release is available here. 13 July 2017 ICMA and AFME have produced a review of the state of infrastructure financing, investment and related initiatives in Europe, and an assessment of how to further advance and encourage private sector finance for infrastructure projects. The review was undertaken as a follow up to the ‘AFME-ICMA Guide to Infrastructure Financing’ published by the two associations in June 2015. Read more. ICMA Future Leaders launches Get Involved! A guide for young professionals in the international capital market. 4 July 2017 We want you to get the maximum value from your firm's membership of the International Capital Market Association (ICMA). Get Involved! is a quick guide to what ICMA does and how it works with its members. 27 June 2017 The ICMA Mentoring Platform has been launched to help individuals at member firms develop their skills by matching those looking for a career mentor with suitable mentors in the international capital market. The new ICMA Mentoring Platform is built on mentoring and e-learning tools, that not only to help match mentors with mentees, but also support them with a wide range of learning and development resources that are accessible from your smartphone, tablet, laptop or desktop computer. The ICMA Mentoring Platform is however only available to staff of ICMA member firms. 22 June 2017 ICMA publishes The European Credit Repo Market: The cornerstone of corporate bond market liquidity which explores and describes the state and evolution of the European corporate bond repo and securities lending market (the ‘credit repo market’). The study builds on ICMA’s previous work with respect to both corporate bond market and repo market evolution and liquidity, and investigates the European credit repo market from the perspective of its role, structure, participants, dynamics, external impacts, challenges, opportunities, and potential evolution, particularly to the extent that this plays a pivotal role in overall corporate bond market liquidity. 2 June 2017 In view of the upcoming implementation of extensive reporting requirements under the EU SFT Regulation, the ICMA ERCC has launched a bilateral reconciliation exercise for repo and buy/sell-back trades. All ERCC members are strongly encouraged to reach out to their major counterparties to test SFTR reconciliation, based on the standard document published by ICMA. Members are requested to conclude the testing by 28 July and to share the results with the ERCC Secretariat as a basis for further industry work to facilitate implementation. Download instructions and template for the bilateral reconciliation exercise. The following firms were admitted to ICMA membership in May 2017. Bringing the total number of ICMA members to 521 members in 61 countries. Click here to view the full list of ICMA members. 17 May 2017 To read the update please click here. To view the video update, please click here. 15 May 2017 ICMA responds to the European Commission’s public consultation on the operation of the three European Supervisory Authorities (ESAs). 15 May 2017 ICMA publishes a Position Paper on CSDR Settlement Discipline. The paper was prepared in close consultation with the SMPC CSDR/Buy-in Working Group, as well as with the SMPC, ERCC, and AMIC. Essentially, ICMA proposes that the cash penalties for bonds should be increased when implemented in 2019, while mandatory buy-ins should not be implemented. ICMA broadly supports the proposed cash penalty mechanism for settlement fails, although it argues that an appropriate calibration of the penalty rates is an essential consideration in its design. ICMA retains its firm opposition to the mandatory buy-in regime, which it argues is fundamentally flawed and will be detrimental to bond market stability and liquidity. ICMA proposes that the cash penalty regime be implemented as scheduled, with a higher than proposed penalty rate for bonds. However, the mandatory buy-in regime should not be implemented as scheduled. The proposed penalty rate for ALL bonds (except SME debt instruments) should be the equivalent of 2.50% annualized. The mandatory buy-in regime should only be implemented as a ‘last resort’ following an assessment of the impact of the penalty mechanism, and other initiatives, on bond market settlement efficiency rates. 12 May 2017 Bringing together various members of the Bail-In Working Group, regulators, issuers and other market participants, the ICMA Bail-in Working Group held a seminar on 7 April 2017 to examine several aspects of the key area of banking regulatory reform - the bail-in regime and capital requirements for banks. Convened under Chatham House rules, the seminar discussed three broad topics: an examination of pricing of bank debt in the current environment; a look at disclosure and credit evaluation of banks; and a debate on corporate governance for banks with a specific look at whether fixed income investors are getting a fair deal. 11 May 2017 ICMA response to FSB’s consultation on the main elements of a ‘Proposed Framework for Post-Implementation Evaluation of the Effects of the G20 Financial Regulatory Reforms’. 11 May 2017 This paper sets out the formal position of the International Capital Market Association (ICMA) with respect to the trade reporting deferral regime under MiFID II/R for fixed income securities. 4 May 2017 Read the press release. 2 May 2017 Read the press release. 26 April 2017 New UK Money Markets Code posted by the Bank of England. Click here to view. 20 April 2017 The ICMA ERCC has published a briefing note on the behaviour of the euro repo market at the end of March 2017, which updates its note on unprecedented price dislocations experienced in the European repo market over the 2016 year-end. 12 April 2017 ICMA is pleased to announce publication of the 2017 ICMA GMRA Legal Opinions. Please see ICMA circular No. 3 of April 12, 2017 for further information. 12 April 2017 Please see ICMA circular No. 3 of April 12, 2017 for further information (members only). China Chengxin International Credit Rating Co., Ltd.
ICMA has now 518 members in 60 countries. Click here to view the full list of ICMA members. 14 March 2017 The latest term sheet for GDP-linked sovereign bonds and additional information on their design and investor reaction have been published and are available from our website. 12 March 2017 ICMA responded to the commission consultation on capital markets union mid-term review. To view the response, click here. 7 March 2017 Click here to view the full list of ICMA members. 20 February 2017 The governing board of ICMA’s European Repo and Collateral Council (ERCC) is the ICMA ERCC Committee consisting of 19 individuals drawn from council member firms and elected annually by ICMA’s ERCC. The election period for the 2017 ICMA ERCC elections closed on Friday 17 February 2017. The names of the 2017 – 2018 ICMA ERCC Committee can be found here. 14 February 2017 A newly revised version of the ICMA ERCC Guide to Best Practice in the European Repo Market has been made available for use by the market as from 8 February. Whilst tidying up many minor details, this latest version of the Guide also introduces many elements of new, extended and refined best practice guidance. Perhaps most significantly, this latest version includes best practice updates in relation to negative repo rates; confirmation and affirmation; and margining. 14 February 2017 A detailed Study of conditions in the euro repo market at year-end shows volatility and market dislocation. 14 February 2017 The ICMA ERCC has released the results of its 32nd semi-annual survey of the European repo market. The survey, which calculates the amount of repo business outstanding on 7 December 2016 from the returns of 65 offices of 62 financial groups, sets the baseline figure for market size at EUR 5,656 billion. ICMA has now 510 members in 59 countries (new: Republic of Korea/South Korea). Click here to view the full list of ICMA members. 30 January 2017 Stéphane Janin, AXA IM, and Axel van Nederveen, EBRD, to be new vice-chairs of the Executive Committee for ICMA’s Asset Management and Investors Council. Click here to read. 17 January 2017 ICMA responds to FMSB’s Transparency Draft New Issue Process standard for the Fixed Income markets. Click here to read. With that, ICMA has now 509 members in 58 countries. Click here to view the full list of ICMA members. 20 December 2016 Click here to see the ICMA Bail-in Working Group’s latest discussion letter to the ECB. The letter sets out thoughts on two issues: (1) assessing and pricing bank credit risk and (2) governance and the rights of noteholders, in each case from the buy-side point of view, and which will be explored further in 2017. 30 November 2016 ICMA published the results of the consultation on its Buy-in Rules, along with discussion points and proposed drafting amendments to the Rules. 30 November 2016 The ICMA ERCC has submitted a detailed response to ESMA’s consultation paper on Draft Regulatory and Implementing Technical Standards under the EU SFT Regulation. This is the second and final consultation on SFTR technical standards, following up on an ESMA discussion paper issued earlier this year to which the ICMA ERCC responded in April 2016. Alongside the response the ERCC submitted some specific comments on the list of proposed reporting fields. To view the specific comments on the reporting fields, click here. The UK’s Chancellor of the Exchequer Phillip Hammond and Chinese Vice Premier Ma Kai concluded the eighth UK-China Economic and Financial Dialogue on 10 November 2016, in London. The Policy outcomes which include mentions of ICMA’s work on Panda Bonds and Green Finance have been published here. 7 November 2016 The AMIC meeting in November included expert views from the cross-border asset management industry on Brexit and the practical implications for capital markets; liquidity in secondary bond markets and coping in a negative interest rate environment. To read the AMIC Review click here. 2 November 2016 The online GBP Resource Centre is now operational and contains standardised disclosure templates on green bonds from issuers and external reviewers, as well as other relevant market resources. To read the Press release click here. 25 October 2016 (Brussels, Belgium) A European Corporate Debt Private Placement (ECPP) Joint Committee coordinated by the International Capital Market Association (ICMA) has launched an updated version of the European Corporate Debt Private Placement Market Guide. 24 October 2016 ICMA's AMIC has submitted its response to the European Commission's consultation paper on whether the existing EU macro-prudential framework is functioning optimally. AMIC raised concern about expanding the mandate and powers of the European Systemic Risk Board (ESRB) to non-banking under the current governance framework of the ESRB. AMIC recommends much greater integration of securities markets supervisory expertise in the macro-prudential policy framework. AMIC also suggests that already reported data is better used to understand financial markets from a holistic perspective. 12 October 2016 The latest edition of the ICMA quarterly report is now available. 3 October 2016 ICMA is conducting a consultation on the new London Term Sheet with interested members of ICMA’s Asset Management and Investors Council (AMIC). 30 September 2016 ICMA was pleased to submit its response to the IOSCO Consultation Report: Examination of Liquidity of the Secondary Corporate Bond Markets. 29 September 2016 (London, UK) The European Repo and Collateral Council of the International Capital Market Association (ICMA) has released the results of its 31st semi-annual survey of the European repo market. The survey, which calculates the amount of repo business outstanding on 8 June 2016 (prior to the Brexit vote in the UK) from the returns of 67 offices of 63 financial groups, mainly banks, sets the baseline figure for market size at EUR 5,379 billion, a 4.1% decrease on the December 2015 figure of EUR 5,608 billion and a year on year decrease of 1.6% from the survey in June 2015. The ICMA European Repo and Collateral Council has sponsored a short study, authored by John Burke, on the trade registration models used by European central counterparties (CCPs) for repo transactions. This focuses on a specific issue (“the counterparty gap”) that emerged from a broader analysis of CCPs’ trade registration models. The issue relates to risk borne by market participants arising from different trade registration models and the different timings and procedures used by the CCPs to manage trade acceptance and trade rejection scenarios. The analysis covers trades that are executed via automated trading systems, traded bilaterally or executed on a name give-up basis via voice brokers. The study contains recommendations from the ICMA ERCC on a number of changes to market best practice that, when adopted, could reduce the risk to market participants arising from the counterparty gap issue. By working together now to clarify the position regarding the counterparty gap issue, market participants and infrastructure providers will achieve an enhanced operating and risk management environment for CCP cleared business and ensure that any future increase in CCP activity e.g. for Dealer to Client trades, can be managed more comfortably. 23 September 2016 ICMA ERCC submitted its formal response to the ESMA Call for Evidence on Asset Segregation and Custody Services. The ICMA ERCC’s response flags the importance of repo and collateral markets; and highlights that these already face significant stress which is bearing on the liquidity of the market. It then observes that there is a risk to make this worse with the asset segregation requirements and expresses full support for ISLA’s more detailed response to this Call for Evidence. To view this ERCC response, click here. 12 September 2016 The Bank of England published a press notice providing further details on the eligibility and sectors under the Corporate Bond Purchase Scheme. The notice can be downloaded here. ICMA was very pleased to accept an award for the GBP at the GlobalCapital Sustainable and Responsible Capital Markets Forum in Amsterdam. 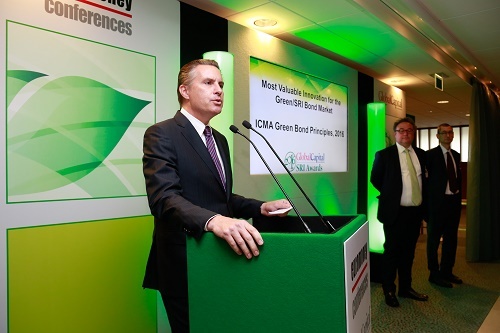 For more information on ICMA's work on green bonds, click here. For a full list of of award winners, click here. 7 September 2016 The ICMA AMIC Bail-in Working Group has sent a discussion letter to the ECB. The letter highlights observations on the operation of the bail-in regime, from the buy-side point of view, and builds upon, and reflects evolutions in thinking since, a letter sent to the ECB on 31 July 2015, also on the bail-in mechanism. 5 September 2016 Today, ICMA is launching a consultation to review and potentially update the ICMA Buy-in Rules under the Secondary Market Rules & Recommendations. This is in response to feedback from members with respect to the efficiency of the existing buy-in process in the current market environment. 31 August 2016 ASIFMA and ICMA have released the “Guide to Infrastructure Financing in Asia”, which is the first comprehensive guide of its kind that outlines how infrastructure projects can be financed in Asia including through the capital markets. ICMA now has 517 members in approximately 60 countries. Click here to view the full list of ICMA members. 12 July 2016 The latest edition of the ICMA quarterly report is now available. 6 July 2016 The ICMA ERCC has submitted a detailed response to the BCBS’s consultation on proposed revisions to the design and calibration of the Basel III leverage ratio framework. 6 July 2016 The International Capital Market Association (ICMA) has today published a study entitled ‘Remaking the corporate bond market’ exploring the evolution of the European investment grade corporate bond market and updating an earlier study published in 2014. For nearly 50 years, ICMA has represented the international capital markets and encouraged international capital market integration. ICMA is an international body headquartered in Switzerland with more than 500 members based in nearly 60 different countries. As such, it is not aligned to any specific financial centre, and does not favour one over another. Following the UK vote on 23 June to leave the EU, ICMA will work actively with all its members, large and small, sell side and buy side, through its Market Practice and Regulatory Policy Committees, Regional Committees and other Working Groups, as appropriate, to help them prepare for the international capital market implications of Brexit. ICMA’s mission continues to be the promotion of resilient and well-functioning international capital markets. ICMA will keep its members up to date with its assessment of relevant new developments: for example, through conference calls, round tables and other events, the ICMA Quarterly Report and the ICMA website. The ICMA Helpdesk and ICMA’s staff are available to answer members’ questions. ICMA has posted on its website a working document on Brexit: Implications for Capital Market Regulation dated 24 June 2016. ICMA will be holding a teleconference for ICMA members at 12.00 London time on Tuesday, 28 June on the capital market implications of the UK vote to leave the EU. 24 June 2016 The ICMA ERCC has submitted a detailed response to the Commission service’s targeted consultation on further considerations for the implementation of the Net Stable Funding Ratio (NSFR) in the EU. The 2016 edition of the GBP benefits from the input of GBP members and observers, from working groups and the wider Green Bond stakeholder community, and also takes into account recent market developments. While the 2016 update continues to be framed by the same four core components (use of proceeds, process for project evaluation and selection, management of proceeds and reporting), a particular effort has been made to recommend best practice on reporting and external reviews, including the use of templates designed to be made available publicly to the market through a GBP Resource Centre hosted by ICMA. It is expected that this will add significantly to market transparency and clarify further the process of Green Bond issuer alignment with the GBP. To view the Green Bond Principles, click here. All European repo market participants are invited to submit data on their repo business outstanding at close of business on Wednesday, 8 June 2016. Click here to view the full list of ICMA members. 23 May 2016 In the absence thus far of enhanced rules on mandatory pool disclosure on a Europe wide basis from the European Commission, industry led initiatives are essential to the continued good operation and standing of the covered bond market. The ICMA AMIC Covered Bond Investor Council welcomes the fact that the Harmonised Transparency Template (HTT) is to be reviewed and enhanced on a regular basis and are taking the opportunity of this review to comment on its effective implementation to date and to provide comments from members on possible features to consider as part of the review process. 29 April 2016 ICMA has today published a briefing note entitled 'Further thoughts on the ECB’s Corporate Sector Purchase Programme', following the announcement of details of the Programme on 21 April. 22 April 2016 The ICMA ERCC has submitted a detailed response to ESMA’s Discussion Paper on Draft Regulatory and Implementing Technical Standards under the EU SFT Regulation. 21 April 2016 The announcement by the ECB on March 10 to extend its Asset Purchases Programme to include investment grade non-bank corporate bonds took the market by complete surprise. This briefing note is an attempt to outline the various considerations that the ECB may need to review as it puts together the final details of its soon to be launched Corporate Sector Purchase Programme, as well as the possible implications for market liquidity and investor and issuer behaviour. Harriett Baldwin, Economic Secretary of UK Treasury will be giving a keynote speech on Offshore RMB market development and Offshore RMB Pricing at the Shanghai Free Trade Zone Bond Seminar in London on 26 April. There are still a few places available for those who have not yet registered. 20 April 2016 (London, UK) A new report, from the International Capital Market Association, shows that the way bonds are traded in Europe is undergoing a period of intense, evolutionary change in response to pressure from regulation and Fintech developments. The report identifies new strategies that are emerging for both buy and sell side participants trading in this market and the options available to platforms and technology providers in the new environment. 18 April 2016 The ICMA ERCC has submitted its response to the FSB's consultative proposals on Possible Measures of Non-Cash Collateral Re-use. 13 April 2016 (London) The Association for Financial Markets in Europe (AFME), FIA, the International Capital Market Association (ICMA), the International Swaps and Derivatives Association, Inc. (ISDA) and the International Securities Lending Association (ISLA) have jointly published a statement that can be used to help market participants comply with new requirements under the European Union’s Securities Financing Transaction Regulation (SFTR). To view the information statement, click here. 12 April 2016 ICMA has today published the 2016 legal opinions which support the Global Master Repurchase Agreement (GMRA), the standard agreement used for international repo transactions. The 2016 opinions support the use of the GMRA in over 65 jurisdictions worldwide. 4 April 2016 The ICMA ERCC Operations Group has submitted a response to an ECB consultative report on the services provided to market participants as part of its Real Time Gross Settlement System (RTGS). The consultation focuses on potential synergies between the TARGET2 and TARGET2-Securities platforms and is the first consultation launched in the context of the Eurosystem’s broader initiative to develop a Vision for the future of Europe’s financial market infrastructure. ICMA now has 496 members in approximately 60 countries. Click here to view the full list of ICMA members. Following the seminal study published in 2014, ICMA is pleased to announce the launch of its 2nd study into the current state and ongoing evolution of the European investment grade corporate bond secondary market. The new study is intended to be more forward looking and focused on potential solutions to the identified risks to market quality and liquidity, as well as re-highlighting the sources of these risks. We intend to complete the study over the coming months, with a view to publishing the final report at the end of June. As in the previous study, ICMA will rely on the active participation and input of its member firms, including broker-dealers, asset managers and investors, corporate and financial issuers, as well as platform providers and intermediaries. Over the coming weeks we will reach out with surveys and/or requests to interview (on an anonymized basis). If you or your firm is happy to participate in the study, we would be delighted to hear from you. We are pleased to attach the Terms of Reference for the study, which was drafted with input and guidance from both sell-side and buy-side members of the Secondary Market Practices Committee (SPMC). If you would like to play an active role in steering the study during the research and writing stages, please do not hesitate to contact us directly. We would like to thank you in advance for your generous cooperation and participation, as it is this that makes the ICMA study truly representative of the state and evolution of the European IG corporate bond market. Note that an ICMA Asian corporate bond secondary market study will be conducted in parallel. This will be led by Mushtaq Kapasi (Chief Representative, ICMA Asia Pacific), in close coordination with Andy Hill, and will be based on the same approach. The intention is to publish both studies on the same date. Click here to view the terms of reference for this study. Click here to see the 2014 study 'The current state and future evolution of the European investment grade corporate bond secondary market: perspectives from the market'. 21 March 2016 ICMA has published a ‘Q&A’ briefing note on the regulatory technical standards of MAR with respect to the presentation of investment recommendations and associated disclosure obligations. The regulation is projected to come into force on 3 July 2016. 3 March 2016 Today four leading European trade associations representing investors, issuers and other market participants have come together for the first time to support the new framework for securitisation regulation. AFME, EFAMA, ICMA and Insurance Europe have issued a joint paper backing efforts by EU policymakers to develop a robust and successful framework for simple, transparent and standardised (STS) securitisation. 23 February 2016 ICMA has today published a presentation for its Aged-Fails Auction Initiative. The governing board of ICMA’s European Repo and Collateral Council (ERCC) is the ICMA ERCC Committee consisting of 19 individuals drawn from council member firms and elected annually by ICMA’s ERCC. The election period for the 2016 ICMA ERCC elections closed today (12 February 2016). The names of the 2016 – 2017 ICMA ERCC Committee can be found here. 11 February 2016 (London, UK) The European Repo and Collateral Council of the International Capital Market Association (ICMA) today released the results of its 30th semi-annual survey of the European repo market. The survey, which calculates the amount of repo business outstanding on 9 December 2015 from the returns of 72 offices of 68 financial groups, mainly banks, sets the baseline figure for market size at EUR 5,608 billion, broadly unchanged from the June 2015 survey figure of EUR 5,612 billion. 1 February 2016 ESMA published the draft regulatory technical standards for CSDR settlement discipline, including mandatory buy-ins. ESMA has clearly made every effort to negate the adverse market impacts and the inherent flaws of a deeply contentious and widely opposed regulatory initiative. ESMA should be commended for pushing the interpretation and papering over the flaws of the Level 1 as far as legally possible, and for recognizing the potentially negative impacts of mandatory buy-ins on the smooth and orderly functioning of Europe’s capital markets. However, despite the good work by ESMA, the regulation still remains highly problematic. Firstly, the RTS do not correct an explicit asymmetry in the direction of the payment of the price differential for the buy-in or cash-compensation. This creates unpredictable and unmanageable risks for liquidity providers and intermediaries and in many instances would render the buy-in process unfit for purpose. Secondly, turning buy-ins into an obligation rather than a right, particularly with a cash compensation resolution, not only creates additional risks for liquidity providers and intermediaries, but it also creates unpredictable and unmanageable risks for investors. Therefore, it remains highly questionable whether the adverse market impacts of mandatory buy-ins will justify any potential benefit. Ultimately, settlement inefficiencies in the European capital markets are primarily the result of fragmented and inefficient settlement systems and processes, rather than the behavior of dealers and other liquidity providers. Accordingly, fixing Europe’s back-office should be the primary focus of market and regulatory initiatives, while the implementation of mandatory buy-ins is postponed for as long as possible. ICMA now has 492 members in approximately 60 countries. Click here to view the full list of ICMA members. 28 January 2016 ICMA has updated its briefing note on MiFID II/R trade transparency requirements in respect to bonds, in light of the draft regulatory technical standards published by ESMA in September 2015. These RTS are still to be approved by the co-legislators and could be subject to further change. For more information about MiFID II, click here. ICMA Members only: Sell-side and buy-side members active in the European corporate bond secondary markets are invited to join the next meeting of the ICMA Secondary Market Practices Committee, to be held at ICMA's offices in London on 4 February at 2 p.m. Jonathan Haynes of DG FISMA will also join the meeting to present on and discuss the European Commission’s work on corporate bond market liquidity. Mr Haynes is part of the core team working on the European Commission’s Capital Markets Union Action Plan and who is leading the Commission’s work on corporate bonds. This will be a fantastic opportunity for ICMA members to engage directly with the Commission in discussing issues related to European corporate bond secondary market liquidity and potential initiatives to improve market liquidity, efficiency, and performance. The full agenda and details of the meeting can be found here. Places are limited, if you are interested in attending please contact Leonie Scott. AFME and ICMA publish joint paper on “T2S Wave 1 – Review and Request for Action Following Migration of Italian Market to T2S"
20 January 2016 AFME and ICMA have published a joint paper on “T2S Wave 1 – Review and Request for Action Following Migration of Italian Market to T2S”, which also includes a short section on specific repo impacts. 20 January 2016 ICMA has submitted its response to the European Commission’s Call for Evidence on the cumulative impact of regulation. The response focuses principally on the issue of market liquidity within the context of rules affecting the ability of the economy to finance itself and grow. It draws on much of the work and research ICMA has undertaken previously related to both European corporate bond secondary market liquidity and collateral and repo market liquidity, and which highlights the real economy impacts of reduced market liquidity on both investors and capital raisers. ICMA hopes that this ‘call for evidence’ is the first step in a continual process of consultation with market stakeholders to support the ongoing refinement and improvement of the European regulatory process, and to ensure the successful attainment of intended outcomes, while promoting resilient and well-functioning European capital markets. For more information on Capital Markets Union, click here. 6 January 2016 The ICMA AMIC Covered Bond Investors Council (CBIC) has responded to the European Commission’s consultation on Covered bonds in the European Union. The consultation was launched on 30 September 2015. The CBIC noted the underlying assumption in the economic analysis that the extreme convergence of covered bond spreads before the crisis should be the norm and that subsequent events point to a sub-optimal fragmentation of markets within the European Union. However, CBIC members argued that markets prior to 2007 had mispriced risks inherent in the securities and that a return to that condition was not necessarily a desirable outcome. Particularly in the absence of implicit state support for the banking system, different covered bonds do reflect different underlying risk characteristics and it is the job of the market to identify and price these risks appropriately. 6 January 2016 ICMA is pleased to make available to the market English versions of the Green financial bond rules of the People’s Bank of China (PBOC). The documents include the PBOC Announcement and the Preparation Instructions on Green Bond Endorsed Project Catalogue (2015 Edition). These translations have been coordinated and made available by ICMA for information only. In case of any discrepancy between these translations and the original Chinese version, please refer to the Chinese version as the official document. To view these amendments, click here. For more information on the ICMA Primary Market Handbook, click here. ICMA’s ERCC Operations Group has published an updated overview of relevant regulatory initiatives on the identification and reporting of SFTs, as well as a supplementary set of slides which analyse and illustrate the operational impacts of the various requirements on the repo lifecycle. For further information and to access both documents, click here. ICMA’s ERCC Operations Group has published a standardised template for trade matching and affirmation of repo transactions. The ‘TMA Template’ sets out recommended mandatory and optional matching fields, working alongside a Glossary of terms defining each of the matching fields. For further information on the initiative and to access both, TMA Template and Glossary, click here. The European Repo Council (ERC) was established by ICMA in December 1999, to represent the cross-border repo market in Europe. Since then it has continued to consolidate and codify best market practice, supporting the development of a robust European repo market with measures including the development of the Global Master Repurchase Agreement (GMRA) and the publication of the ICMA ERC Guide to Best Practice in the European Repo Market; dissemination of market data through semi-annual surveys of the European repo market; and provision of education through courses on repo and collateral. The repo market is the main means by which collateral is sourced, priced and circulated. In the current environment, where post-crisis regulation has encouraged the increased use of high quality collateral to reduce risks in the financial system, the ERC has increasingly focused its efforts on working with the authorities to create an efficient collateral market. In recognition of this evolution of the market and the way in which the ICMA ERC now operates, the ICMA Board has changed the name of the ICMA ERC to the ICMA European Repo and Collateral Council (ERCC) with immediate effect. ICMA’s ERC Operations Group has launched its new webpage today, which will serve as a central information hub for the important work of the Group in the post-trade space. To visit the new page, click here. The European Repo Council (ERC) of the International Capital Market Association (ICMA) has today launched a new study: ‘Perspectives from the eye of the storm: the current state and future evolution of the European repo market’, which looks at how the repo market in Europe is changing in response to regulatory pressures. The International Capital Market Association (ICMA) today announced the publication of a Securities Financing Transaction Annex (“SFT Annex”) that forms part of the ISDA 2015 Universal Resolution Stay Protocol also published today (the “Protocol”). The Protocol builds on the version developed in 2014 in close co-ordination with the Financial Stability Board which focused on amending ISDA Master Agreements for OTC bilateral derivatives to improve the effectiveness of cross-border bank resolution actions. ICMA has published a Q&A paper on MiFID II/R and Repo. To view the Q&A, click here. ICMA has concluded a memorandum of understanding with the Capital Market Authority (CMA) of the Sultanate of Oman to enhance mutual cooperation and exchange of information relating to capital markets. HE Sheikh Abdullah Salim Al Salmi, Executive President, signed for CMA. Martin Scheck, Chief Executive and Leland Goss, General Counsel signed for ICMA. The MoU provides for exchange of information about the laws and regulations relating to regulation and supervision of capital markets and the practices of international and local capital markets, training and research. The agreement will contribute to boosting and enhancing the legislative and regulatory infrastructure of the capital market whether relating to investment instruments, regulations or clearing and settlement systems and avail opportunities to benefit from the mechanisms of regulation of intermediaries and brokerage profession and other related matters to limit unsound practices. ICMA Future Leaders held its first event yesterday evening in London with over 170 in attendance. For more information and to see the photos, click here. ICMA has published a legal opinion for Malaysia covering the Global Master Repurchase Agreement (GMRA), the most widely used standard agreement for international repo transactions. The Malaysia opinion is available to ICMA members only and can be accessed here. For Guidance on the use of the GMRA and legal opinions contact the ICMA Legal and Regulatory Helpdesk. For more information about becoming an ICMA member please contact the ICMA membership department on +41 44 363 4222. ICMA has launched a comparative mapping study of electronic fixed income platforms in Europe. The ICMA Electronic Platform Mapping Study compares the key features and capabilities of 22 electronic trading platforms (ETPs) and information networks that are currently available for trading fixed income in Europe. The landscape of bond trading is changing. Driven by regulatory developments and the search for liquidity, trading is increasingly moving to a variety of different electronic trading platforms. ICMA has undertaken a mapping initiative of trading platforms for European fixed income markets, listing their features and capabilities in a standard format allowing market participants to compare and contrast ETP providers and to determine which platforms best suit their investment and/or trading strategies. As the market continues to evolve the study will be updated. Click here for more information and to view the study. The ICMA ERC Operations Group has submitted a response to the Bank of England’s public consultation on “A new sterling money market data collection and the reform of SONIA”. In line with the scope of the ERC, the response focuses on the Bank of England’s proposals in relation to the collection of data on securities financing transactions. The European Repo Council of the International Capital Market Association (ICMA) today released the results of its 29th semi-annual survey of the European repo market. The survey, which computes the amount of repo business outstanding on 10 June 2015, sets the baseline figure for market size at EUR 5,612 billion. This represents a very small (2%) increase from the headline figure of EUR 5,500 billion in December 2014 and a 2.9% decline in market size from the figure of EUR 5,782 billion recorded a year ago in the survey for June 2014. The ICMA-NAFMII Working Group, which brings together experts from financial institutions in China and the UK to share expertise on processes, practices, and the associated market infrastructure in debt capital markets, has issued its first report: ‘Practices and procedures in the Chinese and international primary debt capital markets’. The report is issued today as Vice-Premier Ma Kai and Chancellor of the Exchequer George Osborne meet in Beijing as part of the 7th UK-China Economic and Financial Dialogue. For more information about ICMA's work in the Asia Pacific region, click here. ICMA has published a substantially revised version of its recommendations, guidance and standard language for managers of new issues of syndicated international bonds - the ICMA Primary Market Handbook. ICMA’s AMIC has submitted a response to the European Commission’s consultation on the review of the European Market Infrastructure Regulation (EMIR). AMIC members have only expressed interest in certain aspects of the review: (1) the functioning of the clearing obligation in the areas of frontloading and risk compression; (2) trade reporting; and (3) the functioning of the pension scheme arrangement (PSA) transitional exemption from the clearing obligation. ERC Operations Group has published a briefing note on the implication for the repo product related to the projected ‘go live’ for Monte Titoli in TARGET2-Securities (expected at the end of August 2015). The note focuses on three key repo aspects: (i) Off-leg rep mismatches; (ii) Term repos; and (iii) Standard settlement instructions. ICMA has submitted its response to the ESMA Consultation Paper 'Regulatory Technical Standards on the CSD Regulation - The Operation of the Buy-in Process'. The updated ICMA ERC Guide to best practice in the European Repo Market is now available. As ICMA prepares its response to the ESMA Consultation Paper on the CSDR regulatory technical standards related to the operation of buy-in, it publishes a Briefing Note on the buy-in process. The paper illustrates how buy-ins work currently, and how they are proposed to work under CSDR. While CSDR does not define what a buy-in is, or what it is intended to do, it does provide for who should be responsible for, and be affected by, a buy-in, as well as the related cash-flows. The deadline for responses to the Consultation Paper is August 6th, and ICMA is currently consulting with its members for input. AFME and ICMA today release the “Guide to infrastructure financing, bank loans, debt private placements and public bonds – smoothing the pathway for effective funding”. This is the first comprehensive and practical guide to help infrastructure issuers, sponsors and project companies more easily tap various types of funding, including bank, private placement and public project bond financing in Europe. ICMA now has 481 members in approximately 60 countries. Save the Date for ICMA's AGM & Conference 2016 in Dublin on 18-20 May! ICMA's 2016 Annual General Meeting & Conference will be held in Dublin on 18-20 May. To view information about the 2015 AGM & Conference in Amsterdam, click here. ICMA now has 469 members in approximately 60 countries. Members of the International Capital Market Association (ICMA), the leading trade association for financial market participants, elected new board members and a new chairman of the ICMA Board at the ICMA AGM in Amsterdam. AMIC’s Market Finance Working Group (formed in December 2014 to address industry concerns about regulatory focus on shadow banking) responded to a second FSB/IOSCO consultation on a methodology to identify NBNI G-SIFIs. AMIC welcomed the FSB/IOSCO’s willingness to refine its approach following the first consultation, but cautioned against including asset management companies as potentially systemically risky entities alongside investment funds. ICMA Executive Education is pleased to announce that the first classroom based Fixed Income Certificate (FIC) programme was held at the end of April 2015. The programme is the natural evolution of the previous International Fixed Income & Derivatives (IFID) certificate programme, which has been the gold standard for financial professionals for nearly 40 years. The new course syllabus is designed to reflect the realities of today’s fixed income markets, while retaining the emphasis on developing a candidate’s practical skills for trading, investment and risk management. The content is organised around three essential topic areas: Trading the Yield Curve with Cash Market Securities, Interest Rate Derivatives, and Credit Trading. Capital requirements and other ‘firm-level’ aspects of regulation. The recent classroom based programme attracted students from around the world with candidates travelling to Barcelona from Europe, the UK, the America’s and the Middle East. This provided those in attendance with an excellent networking opportunity in addition to obtaining a globally recognised qualification. The CFA institute has accredited the FIC as a Qualified Activity under its Continuing Education Programme with candidates qualifying for 30 credit hours. It has also been included on the UK’s Financial Skills Partnership (FSP) qualifications list for ‘Advising on securities in the wholesale market place’ and ‘Advising on derivatives in the wholesale market place’. The next classroom based course will again take place in Barcelona on 25-31 October 2015. The FIC is also available to study via our online learning platform, with the next term starting on 1 July 2015. Full details of the online programme and the learning platform can be found here. For more information regarding any of ICMA Executive Education’s range of courses, please contact education@icmagroup.org. To view the AMIC response, click here. To view the ICMA response, click here. The International Capital Market Association (ICMA) has today published collective action, pari passu and creditor engagement clauses for sovereign debt securities issued under New York governing law. The use of these new terms in government bonds is intended to facilitate future sovereign debt restructurings. ICMA Executive Education (ICMA EE) is pleased to offer a unique scholarship programme to ICMA member firms, allowing employees at the early stages of their careers to participate in our range of leading financial market qualifications at highly subsidised fees. Aimed at candidates under the age of 25, this programme will equip the capital markets future leaders with the required knowledge and qualifications needed to meet their potential. ICMA EE Scholarship candidates will receive a 50% subsidy applied to the existing discounted member rate for each course attended. We are committed to making ICMA EE public courses more accessible to the younger audience of the industry. High quality financial training and executive education is highly valued by many firms and we endeavor to do everything possible to assist our members in developing their employees’ skills. For more information on the scholarship programme and our range of courses, click here. ICMA has responded to the European Commission Consultation Document on a Review of the Prospectus Directive. ICMA has responded to the European Commission Green Paper on Building a Capital Markets Union. ICMA Executive Education is pleased to announce that our globally recognised foundation level training programmes, the Securities Operations Foundation Course (SOFC) and Financial Markets Foundation Course (FMFC), will be available to study via our online learning platform from 1 May. As part of ICMA's commitment to providing the highest standard in executive education, the new online versions benefit from innovative interactive software and a supportive student experience. Clearly defined targets, regular monitoring and structured progress ensure that candidates have all the support required to complete the selected programme. Candidates must register by 30 April 2015 to participate in the next SOFC and FMFC Online Programmes, both starting on 1 May 2015. An introductory programme intended for anyone entering a career in the securities operations area of the financial markets. The content provides candidates with the essential information necessary to develop a thorough understanding of both the debt and equity markets. The course conveys numerous conceptual points, with emphasis on the practical aspects of securities operations, including the day-to-day challenges that candidates will face. Click here to view the course details and to register. An introductory level qualification intended for anyone entering into a career in the financial markets, intended to provide ‘breadth of knowledge’ to make it relevant to people pursuing careers in the front office, middle office and operations areas. The course content places an even emphasis on introducing and explaining the key concepts of each subject area to develop candidates’ practical knowledge and skill sets. ICMA has today published the 2015 legal opinions which support the Global Master Repurchase Agreement (GMRA), the standard agreement used for international repo transactions. The 2015 opinions support the use of the GMRA in over 60 jurisdictions worldwide. The Executive Committee of the Green Bond Principles (“GBP”), a representative group of issuers, investors and intermediaries in the Green Bond market, with the support of ICMA, has published a second edition of the GBP. The GBP are voluntary process guidelines that recommend transparency and disclosure to promote integrity in the development of this fast growing market, by clarifying the approach for issuance of a Green Bond. ICMA now has 471 members in approximately 60 countries. ICMA has responded to ESMA's consultation paper on MiFID II/MiFIR. ICMA Executive Education has completely revised its long established premium qualification for the fixed income market and re-launched it as the ICMA Fixed Income Certificate (FIC). The programme is available in both a classroom based and online format. Registration for both is now open. To view the full syllabus and course details, please click here. A new report ‘Bridging the growth gap: Investor views on European and US capital markets and how they drive investment and economic growth’ has been published by AFME and BCG. The International Capital Market Association (ICMA), the trade body for participants in the cross border debt capital markets, has today published two separate studies which highlight the continuing cumulative effect of regulation on the ability of financial markets to support economic growth. To view the 28th ICMA ERC European repo market survey, click here. To view the ICMA Impact Study for CSDR Mandatory Buy-ins, click here. ICMA has submitted its formal response to the ESMA Consultation Papers on Technical Standards and Technical Advice under the CSD Regulation. ICMA responds, jointly with others, to BCBS/IOSCO’s consultation on "simple, transparent and comparable securitisations"
ICMA has responded, jointly with the GFMA, the IIF and ISDA, to the BCBS/IOSCO Consultative Document on “Criteria for identifying simple, transparent and comparable securitisations". Top representatives from the finance industry and capital markets in Europe and Japan gathered at the Mansion House in London yesterday for the Japan Securities Summit, a unique event co-organised by the Japan Securities Dealers Association (JSDA) and the ICMA. The ICMA ERC has submitted its response to the FSB's Consultative Proposals on Data Collection and Aggregation. The Pan-European Private Placement Working Group (PEPP Working Group) led by the ICMA has launched the Pan-European Corporate Private Placement Market Guide. The Guide sets out a voluntary framework for common market standards and best practices which are essential for the development of a Pan-European Private Placement market aimed at providing medium to long term finance to European mid-sized companies, in close alignment with the European Commission’s goal of bringing about a Capital Markets Union. Ignazio Angeloni, Member of the Supervisory Board of the European Central Bank spoke at the ICMA Capital Market Lecture series in Frankfurt. To view Mr Angeloni's speech on Transparency and Bank Supervision, please click here. ICMA has responded to the FCA’s consultation on restrictions on the retail distribution of regulatory capital instruments. ICMA now has 466 members in 55 countries. ICMA has responded to the Fair and Effective Markets Review. To view the response click here. ICMA responds, jointly with others, to EBA’s consultation on "simple, standard and transparent securitisations"
ICMA has responded, jointly with AFME, the BBA and ISDA, to the EBA’s Discussion Paper on “simple, standard and transparent securitisations".